sur la jolie cour d’un hôtel particulier du 19e siècle. - en métro, les Champs Elysées à 10 minutes ou encore le Louvre ou St Michel en bus. Le métro le plus proche est Anvers (ligne 2) ou Notre Dame de Lorette (ligne 12), le bus est le 85. Le quartier est très commerçant, notamment la célèbre rue des Martyrs toute proche. The apartment is conveniently located, making most destinations easy to get to. 5 minutes walk from Montmartre, 10 minutes walk from the Opera and Grands magasins, 10 minutes subway to Champs Elysées or Louvre ; it’s a very central area. Fresh bread, cheeses, wines and fruits available up and down the block. Confortable et propre, il dispose d’un lit double largeur 180 et d’un canapé lit. Parfait pour un couple ou une famille avec 1 enfant. Il est composé d'une cuisine équipée, d'un coin repas, un espace salon, un espace chambre avec placard, la salle d’eau avec WC très agréable, parquet au sol, télévision, accès internet wifi etc… Tout ce dont vous aurez besoin est là. Les draps et serviettes de toilette sont fournis. Le studio et la cour de l'immeuble sont non fumeur. ☺Comfortable and clean apartment with a king size bed in a bedroom area, cupboard, even a lounge area with a sofa bed, kitchen, shower room and toilets. Convenient for couple or family with a kid. The studio and the courtyard are non smoking area. Thank you Nadine for your amazing hospitality. I loved the location of your studio; very close to Montmartre and Sacre Coeur. It was just right for my holiday in Paris, a nice comfy bed, nice bathroom and kitchen and very clean. Both you and your husband make excellent hosts. I will recommend your studio to everyone I know who wants to visit Paris. I did my research well and found your studio the best value for money in my favourite location Montmartre. I will definitely be back. 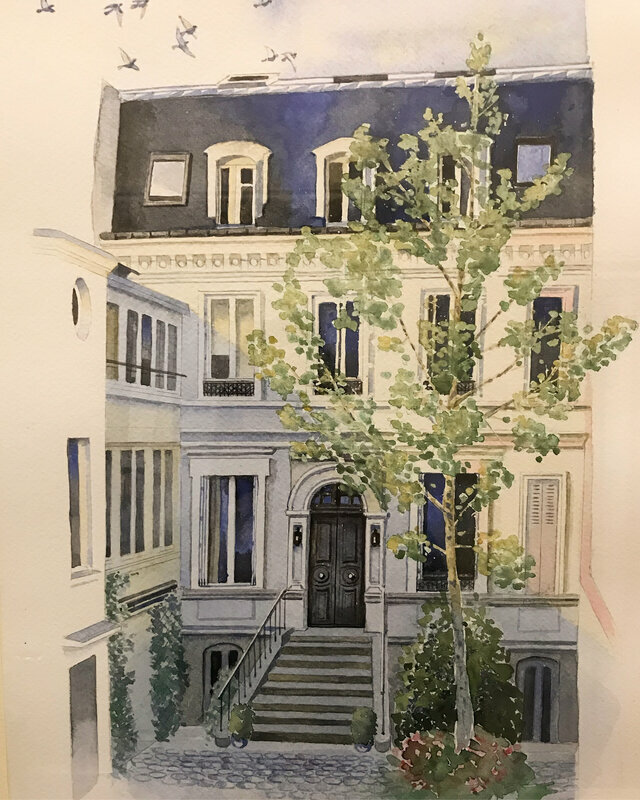 I have lived in Paris, and stayed in Paris many times, and at the beginning of July, 2014, I stayed at the studio of Nadine Giblin in Paris, just near the bottom of Montmartre. The studio was absolutely perfect! Clean, well-equipped, and charming. It might be the best place I have ever stayed in Paris, except for the apartment I had on the ile St. Louis when I lived in the city. It is just a couple of steps below ground level, with its own entrance, next to steps up to a much grander home upstairs where the owner and her family live. You enter the whole through very grand iron gates into a small private cobble-stoned courtyard. And your immediate visual response to such a charming entrance is "Wow!this is amazing!" Nadine is utterly charming and gracious and helpful. She is the kind of person you would like to have as a friend. This is an amazing place, incredibly well-priced for Paris. The bed is very comfortable, and the location is close to shops, bars and restaurants, and close to the Anvers metro for easy access to anywhere in Paris. The only thing wrong about the place and the owner is that you will have to leave, which you will not want to do!" - Kevin Geary, Irish artist, writer, traveller. Lives in the USA.